Photograph of Joachim Angster, courtesy of U-M School of Music, Theatre & Dance. A free viola and piano concert at University Hospital on Thursday is open to all members of the Michigan Medicine community. The performance is part of the U-M Community Outreach Performance Series of the School of Music, Theatre & Dance (SMTD). 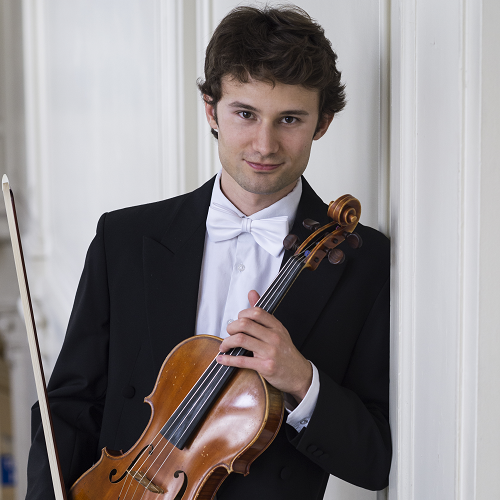 A native of Strasbourg, France, violist Joachim Angster earned a master’s degree from the Lausanne Haute Ecole de Musique in Switzerland before coming to the U.S. to pursue his doctorate in viola performance at U-M, under the mentorship of Caroline Coade and Yitzahk Schotten. He has performed across Europe, Asia and the U.S. as a soloist, and as a chamber and orchestral musician. He will be joined by Chiao-Yu Wu on piano. Look for livestream video of the concert on the Gifts of Art Facebook page.